An unprecedented Millionaire Chess Open Tournament was held in Las Vegas in 2014. The prize was as high as one million US dollars, which leveraged chess tournament to a historical new altitude. It attracted many famous international Grandmasters from around the world to participate. Among the hundreds of players, a Chinese team named Chinese Dragon is particularly noticeable. It is the only Chinese team in this tournament, consisting of players in Chinese National Chess Team and overseas Chinese players in the US, who won the first places in two sections. In the Open Section, half of the quarter-finalists were from the Chinese Dragon Team, and they won a total prize of $ 130,000 in addition to the Best Costume Prize, which could be described as winning of both fame and fortune! The founder and leader of this team was Ms. Ke Chen. Ke Chen, who was the captain of Chinese National Youth Chess Team, has been extremely active in the Chinese chess field. As a rising chess player, her international rating reached 2140 as early as at the age of 13. Ke Chen maintained her outstanding scores even after she went to study in the US. She is currently ranked top 1% among US women chess players. She had excellent performance in many important US tournaments, e.g. she won the 2nd place in the 2010 US Open Blitz Tournament, the 2nd place in the 2012 North American International Chess Tournament, and the 1st place in the 2014 Southern California Chess Open. She also tied for the 2nd place with International Master Ms. Ruth Haring, the President of United States Chess Federation (USCF) in the first US Women's Open in 2014. Meantime, she works as a professional chess coach and has had great accomplishment as well. Among the students she trained, more than ten won chess championship in the tournaments held in Southern California, and more than a dozen of them have been listed on the Top Hundred Player List of USCF in their age groups. Her favorite student Jonathan Chen, who just turned 7 years old, won the first place in National Scholastic K-12 Championship in December 2014, and won the 2nd place in Susan Polgar National Open for Girls and Boys in February 2015. He will represent the USA at the World Youth Chess Championships in Greece in 2015. Ke Chen is passionate about chess. She views that chess is not only a sport, but also a way of communication, just like a language. Chess can not only improve one's intelligence, logical thinking and computing ability, but also promote the development of the emotional intelligence for children. Children, who have learned chess over time, show more patience, know how to make best choices, and more importantly, understand how to deal with frustration. Playing chess helps children develop advanced thinking skills and responsibility for their own behavior, cultivate their good sportsmanship and self-esteem, and improve their ability to focus on subjects, which are all important factors for their future success. Reflections on chess can apply to the reflection on one’s life. Therefore there is a saying that says chess is like life and life is like chess. She thinks that every elementary school shall have at least one hour chess lesson per week. Ke Chen has started to promote the education of chess in the elementary schools in the US. She launched her chess classes in Quail Summit Elementary School and Evergreen Elementary School in Walnut School District, a top-ranked school district in Los Angeles, and she established chess teams in both schools. The chess team of Evergreen Elementary School won the third place of Team Award in Super State Chess Championship 2015 held in Southern California only six months after it was established. In recent years, China also has a growing number of primary schools who set up chess classes. She hopes that one day chess will become a required course of elementary schools in both China and the US. She also anticipates that she will promote the exchange activities of chess between Chinese and American schools. Currently Ke Chen is actively devoted herself to the Sino-US cultural exchanges, the idea of which stemmed from her early experience when she was a teenager. Because she was living in Shenzhen, she had a lot of opportunities to compete with the children in Hong Kong. It was a novel and interesting experience to her that children with different colors, speaking different languages, and having different cultural backgrounds played in the same arena, which made her eyes and mind wide open. She kept in touch with many foreign friends since then by exchanging mails. Some of them went to Stanford University and Harvard University later. There are high-end chess exchange activities between China and the US, such as the Sino-US Chess Tournament and Sino-US Universities Chess Tournament. However, there are no exchange activities for the juvenile players in the two countries. Ke Chen looks forward to building a bridge of Sino-US cultural exchange of chess for juvenile chess players through her efforts. The chess cultures in China and the US have similarities and differences. In China, people usually focus on its competitiveness and regard it as a sport. In the West, chess is not only embodied the competitiveness of sports, but also shows a lot of cultural characteristics because of its long history. She visited the Mechanics' Institute Chess Club in San Francisco, which is located in a library in downtown San Francisco. It sponsors a chess tournament every Tuesday. The host of her visit was John Donaldson, an International Master. At the entrance of the club, there are a lot of pictures of famous chess masters who played in the chess club, the most famous of whom is Bobby Fischer. Among the players, there were people of all ages ranging from little kids to over sixty-year-old elderly people. Some families participated in the event with all members: the father and the children competed in the tournament side by side, and the mother accompanied next to them. All the players played the games seriously. It showed her a cultural and historical atmosphere. Here, chess has become a life style and a necessary weekly gathering. Coffee and small snacks were placed next to the field, which made you feel it like a cafeteria, or a chess salon. The club was founded in 1854 and has a history of 161 years. There are many chess clubs in Los Angeles, which are similar to it, and most of them have 40-50 years history. Therefore, the chess culture is deeply rooted in the US, and is an integral part of life of many people. There is no chess league in the US yet, but the number of open tournaments far exceeds that in China. Basically there are open tournaments every week. Some are sponsored by national organizations such as Continental Chess Association and are held once a year, while some others are weekly tournaments sponsored by local chess clubs. Children have a lot of training opportunities. Jonathan Chen participated in over 30 tournaments during one year period before he played in National Scholastic K-12 Championship in Florida, about 2.5 tournaments per month. This isn’t much if comparing to his opponents, who surprisingly have participated in more than 200 tournaments, i.e. more than two tournaments a week at the age of 8. This shows how many opportunities of the tournaments there are in the US. In addition, the US rating system is more comprehensive. The rating system formulated by USCF, which is similar to FIDE rating system, is adopted nationwide. This system has over 100 years of history. New players start from 0 and the players’ USCF rating is calculated based on their performance in each game, which ensures the continuity and consistency of the rating. When the players participate in games having different sections, they are determined to attend certain sections by their ratings. Chinese players can also obtain the US rating if participating in the US tournaments. If one performs well and receives the US National Master title or above, he will have a good chance to be admitted to a prestige school and receive a full scholarship at the time when applying for the admission to college. In order to develop the chess exchanges between Chinese and the US juvenile chess players, Ke Chen planned various forms of exchanges, one of which is to organize Chinese juvenile chess players to participate in the tournaments in the US. There are several important high level chess tournaments in California every year, and they are very suitable for young chess players. These activities not only provide a broader platform for Chinese young chess players, but also build a bridge between the chess clubs and chess schools in the two countries to learn from each other. Ke Chen said that after years of planning and preparation, she will start KLC Sino-US cultural exchange activities in July this year. Now not only the professional players in the Chinese National Team, but the young chess players will be able to launch expedition to overseas, and show the elegance of Chinese players in the arenas of American tournaments. The visits between Chinese and American schools which have chess programs are also a form to develop the exchanges and friendship. At present, there are many schools in China which set up chess classes as an elective or compulsory school curriculum. The US also has a lot of elementary schools which keep a tradition of having chess teams. There are statewide scholastic chess championships in Southern California and Northern California every spring. Dozens of schools compete in the tournaments in three days. Through the visits to the schools having chess programs, Chinese youth player are able to access the classrooms of American schools, learn and exercise together with their American counterparts, and experience in depth the collision of knowledge, culture and friendship. In addition to the exchange of students, chess coaches can also be arranged to visit each other. 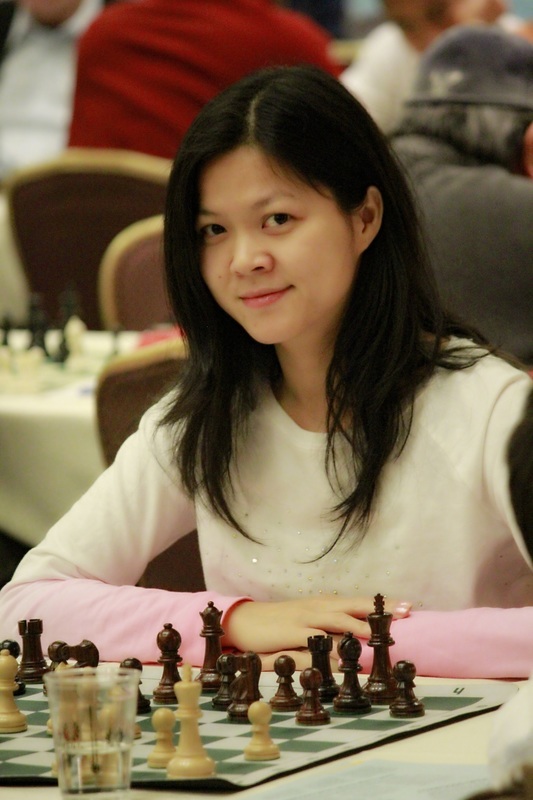 She prepares to organize Chinese coaches to visit the famous American chess clubs and schools, investigating the approaches to promote chess education. Because of the outstanding contribution that Ke Chen made to the promotion of chess, she was awarded as Outstanding Chinese Youth in Southern California in 2013, and became the first chess player who won this award. Ke Chen hopes that China and the US will learn more and more from each other on the chess cultures through her efforts, and she will be able to create more opportunities for Chinese chess players to go abroad to compete in the international arenas. Their overseas experience will expand their visions and lay a solid foundation for them to become future international talents promoting the internationalization of Chinese chess. She also hopes that Chinese and American youth chess players can establish friendship and develop mutual understanding through playing chess, and build new channels for Sino-US friendship and cultural exchange by making use of chess as the media and platform.